Everyone that Kaya loves is in danger and she is the only one that can protect them-but it requires a huge sacrifice. 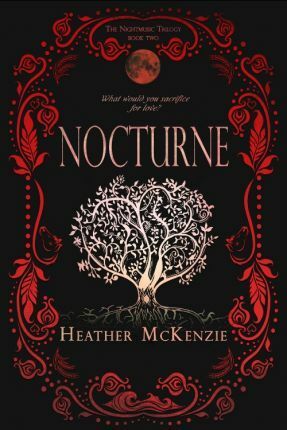 A heart-pounding journey of self-discovery, Nocturne is the transformative second installment of the Nightmusic Trilogy. Finally free of her father, Kaya has the one thing that keeps her heart beating--Luke. Blissfully content in his arms, everything seems perfect...until their world is shattered by a deadly invasion. When an old ally comes to the rescue, Kaya wants none of it. She is devastated to learn the identity of her attacker, and that she must do something truly heartbreaking if she wants to save the ones she loves. Sacrificing everything and sinking into bottomless sorrow, Kaya finds solace in an unlikely friend--one who shows her a different kind of love, and helps her discover an inner strength she never thought possible. Heather McKenzie is a Canadian author whose first book Serenade was released in April 2017. A professional singer/songwriter with five albums to date, she has been telling stories through music for years and just recently fell in love with novel writing. Heather pulls from her extraordinary experiences as a musician to fuel her passion for creating Young Adult fiction. A rocker at heart, a mom of three, an aspiring painter, and a lover of animals, she is kept grounded by her husband at their home in Edmonton.